Maybe I am getting the flu and that is why I am grumpy otherwise it is the complete loss of attention to the major issue of our time, and sorry folks it is not global warming. It is the change in the geopolitical world from one dominated by democracies to a world dominated by quasi-corporate democracies and one party states. Europe is in more trouble than the early settlers by reason of a loss of control of its borders and a loss of pride in its Judeo-Christian origins. It has morphed into a socially and politically correct nebulous fog with an enormous debt. Debt is generally the honesty pill of rubbish policy. America is in trouble, as I predicted in 2009, for most of the reasons Europe is. America also seemed to suffer that other affliction worse than the flu, an unbridled belief that others would adhere to the purity of your economic theories coupled with a benevolent romantic feeling of how things will pan out for you ”over the long term”. They don’t. The global financial crisis was really a global debt crisis. A GDC not GFC. A few years ago the crisis was about private debt but the debt is still there, the crisis is not over, it’s now just public debt. On Tuesday the US hit its Congressional approved debt limit of $14.3 trillion. There doesn’t seem to be anything on the horizon to change things and while the debt is still building the crisis remains. We are heading the same way. We promise to repay our debt but Labor never does. Once a country, which is doing quite well by breaking your well meaning trade laws, gets it foot on your throat it increases its pleasure by increasing the pressure. Soft authoritarianism turns into hard authoritarianism backed up by something that the west was good at, a state of the art highly trained and proficient military. Do we honestly believe that countries which have scant regard for the suite of issues that we hold sacred, such as our legal code and individual rights, are nonetheless going to be leading the charge, hand in hand with Australia, to cool the planet? They know how to deal with us, mouth the platitudes then carry on regardless; with any luck we can do some more self-inflicted damage to ourselves. Their game plan is pure and ruthless, be No1 by whatever it takes. We have sold our farm processing sector; we are now selling substantial sections of our better land. We have moved our manufacturing away and increased the price of power so manufacturing does not come back. Yes, and we now have our debt. The Labor party are trying as hard as it can to make it politically incorrect to discuss debt but I strongly believe that in Canberra its effect will be the only subject in town when it finally hits the fan. So in Australia how do we manage a future dispute with another nation’s government about its strategic economic interest in our land? Do we believe that a dispute will never arise? There is quite a difference between taking a corporation to court compared to taking what is in fact a 100 per cent owned arm of a foreign government to court. Judicial action in these cases might have some distinct drawbacks. Those who are making the money from the current sales will say that this is just parochialism and I suppose that is to be expected. They can hardly disagree with the largesse that has set them up for life, but they will not be offering up their windfall to solve the future problem. In the past we have had foreign investment but not ownership by foreign countries like we are getting now, predominantly by China. The exception to this, of course, is the British empire in its role in Australia around about 1788. I may be going out on a limb here but I do not think indigenous Australia ended up with the strategic upper hand in that engagement. Indigenous Australia should have listened to the sage advice that a foreign government taking ownership of your land is just the market economy helping you out and they would be completely overreacting and unnecessarily parochial if they believe that it would in anyway diminish their ultimate hold on the land. Just in case you’ve missed your caffeine this morning – I dare to venture that Senator Joyce was employing a touch of irony in his final sentence. Which is more than one can say for the Great Green Future of those Aussies presently employed in industries associated with the making of iron and steel, et al. Barnaby’s having a lot to say today – and getting media play. 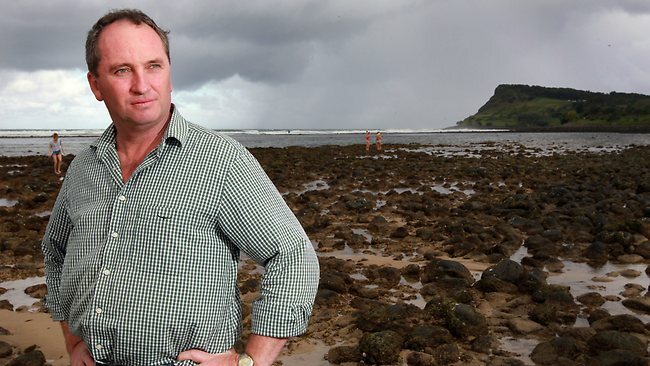 Nationals Senator Barnaby Joyce says Australia’s best farming land should be off-limits to all foreign investors and mining companies as the Greens demand a review of investment rules, accusing the government of putting coal sales ahead of food security. Amid revelations a Chinese mining giant spent $213 million buying 43 farms for coal exploration in the NSW Northern Tablelands, the opposition regional development spokesman said this morning legislation was urgently needed to protect prime agricultural assets. “I think prime agricultural land, and we have to remember that we are talking about the very best land here, it should be off limits because it is irreplaceable,” Senator Joyce told ABC Radio. Senator Joyce said prime agricultural land would be identified by soil structure, yield type, and water bearing capacities, and would be protected by state-based legislation. He said the Foreign Investment Review Board powers should be reviewed and supported independent Senator Nick Xenophon’s call for the threshold for FIRB intervention on purchases to be lowered from the current $231m to $5m. Currently foreigners purchasing more than a 15 per cent-plus stake in most assets worth more than $231m are required to seek approval from the FIRB. “I believe should be lowered. To try and pick a number on your show this morning I think would be slightly nave on my part. But I think it should definitely be looked at,” Senator Joyce said. Assistant Treasurer Bill Shorten, who has been commissioned by Julia Gillard to review land ownership, yesterday rejected calls for an inquiry into FIRB’s rules. PM-in-waiting Bill Shorten is Minister for Financial Services and Superannuation. The same bloke who’s mother-in-law is directly implicated in the infamous Heiner Affair cover up – that was recently covered up again by a Greens-Labor-Steve Fielding travesty in the Senate. The same bloke who thinks of your super as a “significant national asset” … a kind of “sovereign wealth fund”. And has already begun implementing first stage policies to steal it.